"You work so hard because you have goals in life, you want to be in the Hall of Fame, but also, being on the cover of a video game is something I’ve always dreamed of and I’m happy to be in this position." 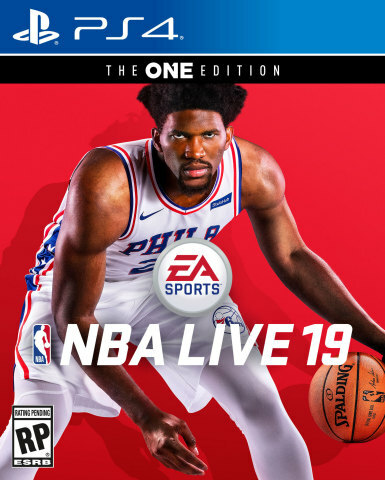 REDWOOD CITY, Calif.--(BUSINESS WIRE)--Last night at the NBA Awards, Electronic Arts Inc. (NASDAQ: EA) revealed Joel Embiid as the cover athlete for EA SPORTS™ NBA LIVE 19 , adding to the accolades he has achieved over the past few years. Embiid was the third overall pick of the NBA Draft 2014 presented by State Farm and claimed a spot on the All-Star roster for the first time this season. He also led his team to their first playoff appearance since 2012 while averaging nearly 23 points and 11 rebounds a game. “It’s great, it’s amazing. I’m thankful for this opportunity, especially as a basketball player,” Embiid said. “You work so hard because you have goals in life, you want to be in the Hall of Fame, but also, being on the cover of a video game is something I’ve always dreamed of and I’m happy to be in this position.” Read the rest of the interview here. ***CONDITIONS, LIMITATIONS AND EXCLUSIONS APPLY. SEE ea.com/ea-access/terms AND ea.com//ea-access FOR DETAILS.